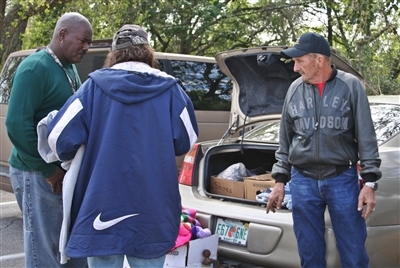 Thomas Brown of Tampa Crossroads, left, talks with homeless veteran "Caveman" as Curtis Spivey of St. Catherine UMC, Bushnell, prepares to distribute blankets and tarps from the trunk of his car. Photo by Susan Green. They are invisible people living in the shadows of the Sunshine State. Homeless veterans surviving on half-eaten meals from garbage bins, sleeping in ramshackle tents in the woods, carving out a primitive existence on the edge of a society they served in uniform. The number of veterans living on the streets in Florida on any given night is about 12,000, approximately 13 percent of the state’s homeless population, according to a 2011 Florida Council on Homelessness report. Now United Methodist churches across Florida are reaching out to homeless veterans, hoping to help break the cycle of despair. Janet Spivey and her husband, Curtis, members of St. Catherine UMC, Bushnell, are among those trying to help. They are members of the Patriot Guard Riders, a group that provides motorcycle escorts for military funerals. Through that volunteer service, the Spiveys met a disabled veteran who talked about a tremendous need for housing for veterans. In January, when members of St. Catherine’s were discussing possible new outreach ministries, Janet suggested helping homeless veterans. 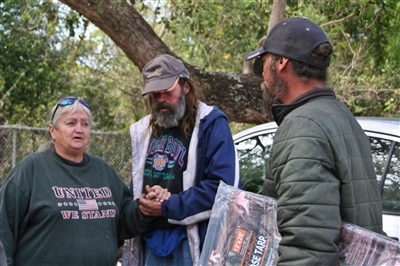 Janet Spivey, left, offers encouragment to veteran "Caveman," center, and Daniel, who live in tents in the woods behind a suburban shopping center. Photo by Susan Green. "If not for them, we wouldn't be free to worship where we choose," she said. The congregation and Pastor Haig Medzarentz agreed. Janet contacted the Sumter County Veterans Service Office, which referred her to other counties where there is a need, and the church began collecting clothes and money for sleeping bags and tents. "The response has been overwhelming," Janet said. First UMC, Bushnell, donated everything left over from a church rummage sale. A Lutheran Church in Brooksville donated 19 boxes of men's and women's clothing, while a local Baptist Church collected clothes, blankets and money for the ministry. A Methodist couple, John and Kitty Hahn, who travel and do mission work, scoured thrift stores for clothes and donated handmade wooden crosses to be given to veterans. "It now has just snowballed into a wonderful outpouring of love and support," Janet said. The U.S. Department of Veterans Affairs (VA) estimates that 131,000 veterans are homeless on any given night, while the National Coalition for Homeless Veterans puts the number closer to 200,000. 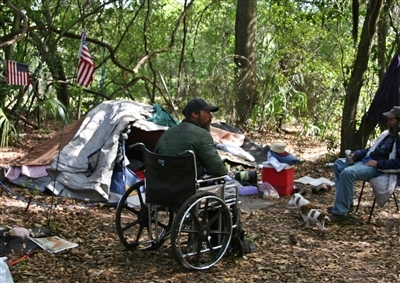 Above, Daniel, left, chats his with his buddy, a homeless veteran named "Caveman," in a tent community set up in the woods behind a suburban shopping center. Photo by Susan Green. Below, Rev. 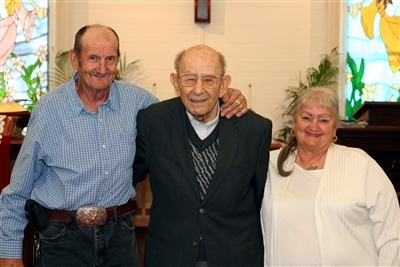 Haig Medzarentz, pastor of St. Catherine UMC, Bushnell, poses with Curtis and Janet Spivey. The pastor and congregation have supported the Spivey's ministry for homeless veterans since January. Photo by Scott McBride. Florida has the nation's third-highest homeless population, estimated at 56,000, and a 2011 report from the Florida Department of Children and Families puts the number of homeless veterans at 12,240, second only to California. There is no known homeless veterans' camp near St. Catherine's, so the Spiveys work with Tampa Crossroads and other agencies to find homeless veterans in need in Hillsborough, Pasco, Lake, Sumter and Citrus counties. “I wouldn’t take just anyone out to the homeless camps, but Janet and Curtis are solid people who really want to help,” said Thomas Brown, an outreach coordinator with Tampa Crossroads. The nonprofit group runs halfway houses that help homeless vets. Brown, an Army veteran, visits three or four homeless camps daily. He said donations mean a lot to the veterans. Brown cited VA reports that show recently discharged veterans facing an unemployment rate three times the national average. “There’s a perception out there that homeless vets are all drug addicts and alcoholics, but that is not the way it is,” he said. Some just want to be left alone, he said, but for others he sets up interviews with case workers who line up benefits, housing and job leads. Janet said the homeless she helps are grateful and take only what they need. She remembered a former soldier nicknamed "Caveman," who had requested a sleeping bag. She brought him that and a jacket. "I said, 'Look at this nice jacket. It's just your size.' And the tears just rolled down his face." She and Curtis also take Bibles. "I don't push them on the people," Janet said, "but they're out there, and if they can read it, it gives them a little bit of hope." Norman had lived in the woods for years when he first came to the cold weather shelter at First UMC, Port Orange. The shelter in the church’s fellowship hall opens when the local temperature falls below 40 degrees, providing a hot dinner, thick mats, plenty of blankets and a hot breakfast in the morning. “On the nights we would open the shelter, Norman would ride his bicycle over to the church early and help us cook and set up for the night,” said Christie Hyde, coordinator at Room At The Inn Cold Weather Homeless Shelter. 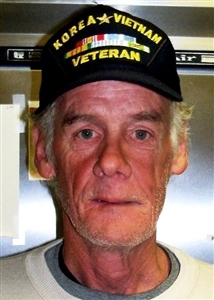 Norman grew close to the shelter’s previous coordinator, Mike Ellis, who counseled the veteran and helped him focus less on anger and negativity. “Mike would have Norman over to his house to do laundry, cook him meals and became his friend as well as his counselor,” Hyde said. Not long after Ellis moved to Washington State, Norman got his own apartment. He continued to volunteer at the church’s Thrift Boutique and is a fixture at the shelter. “Even though he now has a place to stay, he sleeps at the shelter overnight anytime we’re open to watch over things and provide consistency through the night as our volunteer shifts swap out,” Hyde said. Men and women veterans often spend time in the tents, and Janet remembered one homeless couple, both veterans, who had children ages 9 and 10 with them before one of the agencies found them an apartment. She said some return from combat and simply can't find a job. Many, particularly Vietnam and Desert Storm veterans, have disabilities stemming from emotional trauma or chemical exposure, she said. Caveman said he has been mostly living in a tent since 2002. He occasionally works odd jobs. "But I got some medical problems," he said. "I think the majority of what we're seeing are victims of circumstance," said Janet, whose first husband, a Marine, died in Vietnam in 1965. "If they [people] knew, I think there would be a lot more caring." Daniel, a neighbor of Caveman's who helps look out for him, said he has been homeless for 19 years, living in other states before Florida. He said having no permanent address has hurt his job opportunities. He said he appreciates the Spiveys. "They talk to me like I'm a human, not like a piece of dirt."